More Signs of the Times - Almighty Father, your seeking servant prays for guidance. 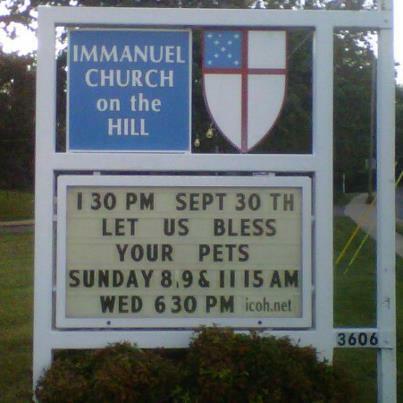 Most churches in the area are conducting their Blessing of the Animals liturgies the 1st weekend of October. At our church, we ahead of the times and our sign shows it. Also, Pumpkins are coming and the annual Pumpkin Patch, which proceeds fund the entire Outreach mission and ministry, opens Sunday, October 7th. So we're getting the critters taken care before the gourds land. This is still quite the toy of the new Associate Rector. It's also a good way to talk to people and traffic and show this church is ALIVE! Come on over! We want to be your worship home!